Aging Aged in 90% French and 10% American oak–37% total new oak–for 11 months. 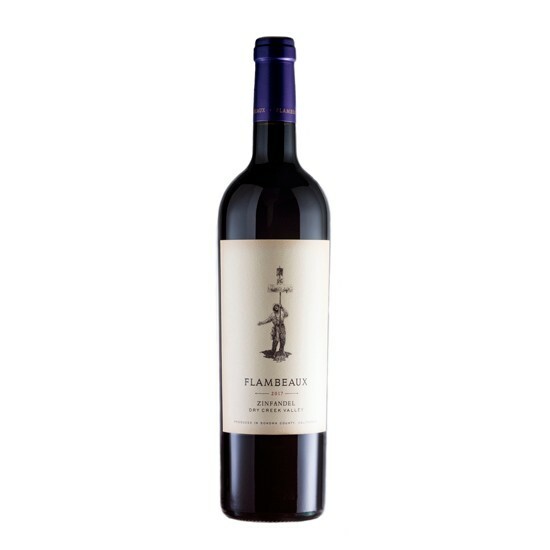 Tasting Notes The 2017 Flambeaux Dry Creek Valley Zinfandel offers flavors of bright candied cherries with a dusting of baking spice framed by warm, toasty, cedar box notes. 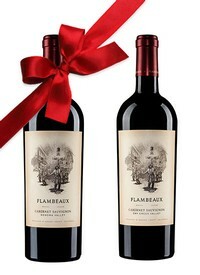 100% estate grown, Flambeaux Wine's first vintage of Zin strikes a wonderful balance between fresh and rich. Vineyard Profile The Flambeaux Vineyard in Dry Creek Valley is located in the sweet spot for vineyard elevation – about 350 feet above the valley floor. The soils are the Boomer Loam series, a Metamorphic soil characterized in the Dry Creek area by crumbly red, iron-rich soils. The Zinfandel is grown in terraced rows in the steep hillside that helps drain away both excess water and also cold air, naturally aiding in keeping the vineyard safe from frost. The hillside's thinner soils helps to regulate the sometimes abundantly growing Zinfandel, providing us fruit that is concentrated and full of a natural density. Production Notes Picked before dawn, the grapes arrived at the winery cold and were hand-sorted and destemmed in open-top stainless steel tanks. After a short cold soak, the wines fermented over a two week period in tank with punchdowns utilized to gently integrate the skins with the fermenting juice. Once fully fermented, the wine was pressed off the skins and put into barrel where it spent its life until just before bottling where it was blended and bottled in August. Food Pairing Zinfandel is a wonderfully diverse pairing partner. It works great with lighter meats like turkey, but is perfect with richer dishes like Korean bbq beef, spicy jambalaya, duck and andouille gumbo. And what can be better than a burger and Zin pairing! ?